One of Australia’s most respected public servants, Mr Terry Moran AC has been appointed Chancellor of Federation University Australia. Mr Moran was appointed Secretary of the Department of Premier and Cabinet for the State of Victoria in July 2000 and held this position until his appointment in 2008 as Secretary of the Department of the Prime Minister and Cabinet, the most senior position in the Australian Public Service. He was appointed by the then Prime Minister Kevin Rudd, and continued in the position under Kevin Rudd's successor, Julia Gillard. Mr Moran was responsible for leading the work of the Department on issues including national security and international policy. He was also involved in shaping major policy reforms for Australia’s public hospital system. Mr Moran comes well qualified for his new position of Chancellor at Federation University Australia, the nation’s third oldest tertiary education provider and a dual-sector University. His first position as a public sector Chief Executive Officer (CEO) was at the Office of the State Training Board in Victoria. He was the first CEO of the Australian National Training Authority in Brisbane and became Queensland's Director-General of Education in August 1998. 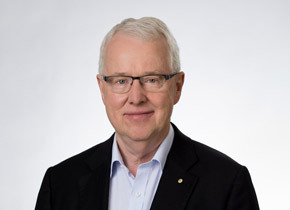 In 2006, Mr Moran was appointed as an Officer of the Order of Australia for service to public sector leadership in key policy areas and program implementation, including technical and further education at state and national levels. Earlier this year Mr Moran conducted a strategic capability review of the Southern Australian TAFE system at the request of the SA Government. Mr Moran is also an Ambassador of Teach for Australia, part of a global movement dedicated to breaking the cycle of disadvantage through teaching and leadership in education. He also chairs the Melbourne Theatre Company and the Centre for Policy Development, an independent think tank. In 2012, he was invested as a Companion of the Order of Australia (AC) for eminent service to the community. Professor Helen Bartlett, Vice-Chancellor and President of Federation University Australia, said the University Council was honoured to have someone of Mr Moran’s calibre in the role of Chancellor. “Terry Moran is one of the nation’s pre-eminent public figures who is more than qualified to take a lead role in the governance of our institution,” she said. Mr Moran, who resides in Melbourne, will begin his three-year term as Chancellor at Federation University Australia on 13 October.